A bevy of highly specialized job postings suggests Amazon is indeed laying the foundation for a bookstore business that extends beyond Seattle’s University Village. That, or Amazon’s sole bookstore will have the most overqualified staff ever seen in a small bookshop. A bevy of recent highly specialized job postings suggests Amazon.com is indeed laying the foundation for a brick-and-mortar bookstore business whose ambitions extend well beyond the University Village location it opened in November. That, or Amazon’s sole bookstore will have the most overqualified staff ever seen in a small bookshop. The positions range from senior program manager — preferred qualifications: an MBA or an advanced degree in a quantitative field ­— to a data engineer, a financial analyst, and curators for literary fiction, nonfiction and children’s books. All these jobs make specific reference to a brick-and-mortar bookstore. Most have been posted since late January. U.S. added just 151,000 jobs in Jan.; unemployment at 4.9 pct. There are also postings, first uncovered by tech website Re/code, for associates and a store manager in the San Diego area, indicating a second store is likely in the works. These signs that Amazon is tinkering with a new business idea come amid speculation that the tech giant, which last year for the first time surpassed $100 billion in revenue, intends to delve in a major way into the brick-and-mortar world it helped disrupt. The speculation was sparked Tuesday by the CEO of General Growth Properties, a giant mall operator, who during an earnings call said Amazon plans to have hundreds of bookstores. On Wednesday, GGP issued a statement saying Chief Executive Sandeep Mathrani had never intended to portray Amazon’s goals. Amazon has kept mum about any physical-bookstore plans, although The New York Times cited anonymous sources confirming that the company had such a retail project in the works, albeit on a more modest scale than suggested by the mall executive. It seems unlikely Amazon would execute a major expansion into a high-cost, low-margin sector that has seen better days, in part because Amazon’s online bookstore and e-book business took a big bite out of it during the past decade. But the company is known for wild experimentation in a wide array of segments, from robotics to 3-D printing. Some of these fail; others, such as Amazon Web Services, the company’s data-storage and computing-services division, become big businesses. Kathy Doyle Thomas, chief strategy officer at Half Price Books, a privately owned bookstore chain, says she understands why Amazon is toying with the idea of a physical retail presence: Many readers still love shopping. And “people who come into our store spend more money than when they look online,” she said. 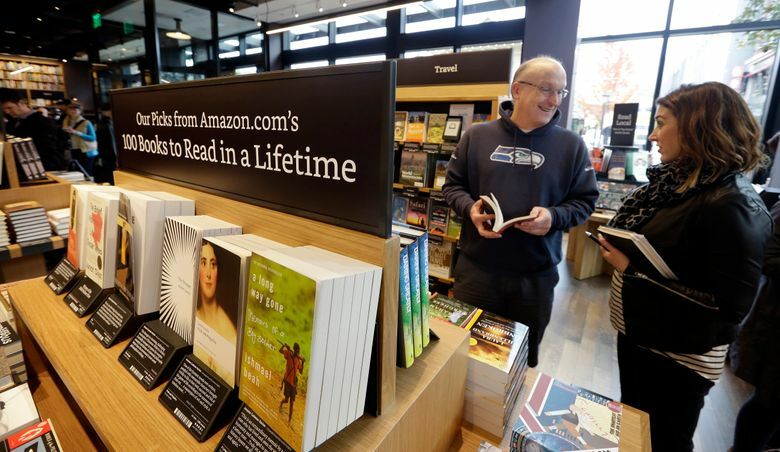 A mall-based Amazon chain poses a new challenge to the booksellers that survived the tech giant’s initial online onslaught. For example, Doyle is concerned about its Seattle rival elbowing competitors out of shopping centers, many of which offer exclusivity to certain types of retailers. But Amazon will have to learn how to deal with the challenges of brick-and-mortar retail from which it has been shielded, such as day-to-day, face-to-face interaction with clients. “It’s really challenging to have a customer look at you in the face,” she said.